I really like hide glue and I use it exclusively for building guitars now. Hide glue is made from animal hides and consists of small flakes which are soaked in cold water for an hour and then heated and applied with a brush. Always mix glue and water by weight and not by volume. 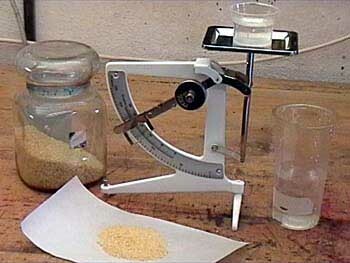 Mix about one part of hide glue with two parts of water. The consistency of hide glue can always be adjusted by adding water. Do not prepare too much of it at a time and keep it in the fridge. Don't worry - hide glue is absolutely non-toxic. It gives a very strong joint and sets very quickly, but you should leave it to dry and not do any further work on the glued-together parts for the next 24 hours. Hide glue joints have been around for centuries and some of the joints made with this type of glue are still as strong as ever. Hide glue must never be brought to the boil. 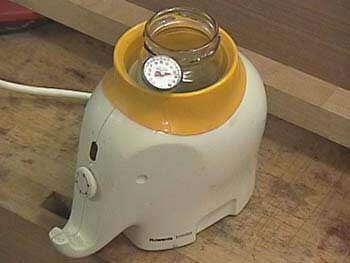 For this reason it is advisable to heat the mixture in a water-bath or in a baby-bottle warmer to a maximum temperature of 65ºC (150ºF). 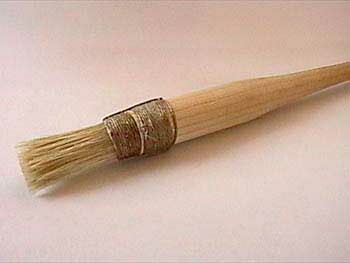 The brush for applying hide glue mustn't contain any metal parts; for best results use a special hide glue brush. Parts are best glued up at normal room temperature; if it is too cold, hide glue will immediately start to gel. By using a hair drier or a moderately-set heat gun you can keep the glue and the parts hot enough until clamping pressure is applied. One great advantage of using hide glue is that joints made with this type of glue can easily be disassembled again by reheating. If an undone joint is to be reglued, the remaining pieces of glue don't have to be removed as the newly-applied hot glue will combine with it. And, finally, hide glue is not as slippery as for instance PVA glue so that fewer additional clamps are needed to keep the pieces in place. Note: hide glue is my personal favorite; if you don't want to deal with it use PVA glue instead.